Rudolf Bystricky, born in Marikova (Slovakia) on January 20, 1908. Doctorate from the Charles University in Prague. Member of the bar. 1945-1951, Diplomatic service: legal and economic adviser to the inter allied Commission in Budapest (1945-1947); head of the economic service at the Ministry for Foreign Affairs in Prague (1947-1949); ambassador in London (1949-1951); department of the foreign legislation to the ministry for Justice (1951-1953). Editor of the Czechoslovak Journal of international law; member of the editorial team of the Review of contemporary law. Author of a number of books, papers and articles. He and his wife left Czechoslovakia after the 1968 invasion. 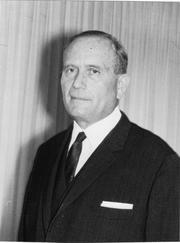 From 1969 he continued his career as a Professor of International Law in Geneva and Fribourg, Switzerland. It is here where he wrote his last book; Le droit de l’integration econmique socialiste (1979). Throughout his life he was awarded with a number of Honours. University of Friburg awarded him Honoris Causa in 1984. He died on 13th December 2001 in Geneva and his wife died in 2005. Mirova smlova s Nemeckem z hlediska mezinarodniho prava. Are you sure you want to remove Rudolf Bystricky from your list? October 5, 2010 Edited by Peter Bystricky Edited without comment.